Personally I’m not mad about tinned strawberries, they always seem to be too mushy, despite that this recipe looks interesting. I think it would work with fresh or frozen strawberries which are a lot firmer. I’d try it with blueberries as well. 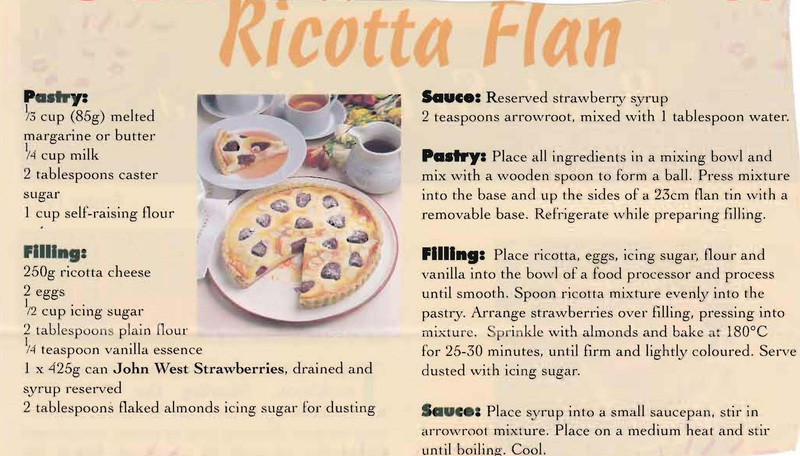 This entry was posted in All Recipes, Desserts and tagged 1990s, almonds, blueberries, icing sugar, pastry, ricotta, ricotta flan, strawberries by bebsrecipes. Bookmark the permalink.